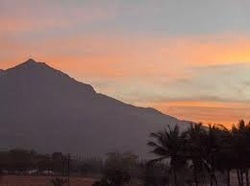 Another sacred mountain is to be found in Tiruvannamalai, South India. The Hindu sage Bhagavan Ramana Maharshi said that Mt. Arunachala was a remnant of the lost continent of Atlantis. According to the occultist Kenneth Grant, Mt. Arunachala constitutes the most powerful concentration of spiritual energy on this planet. And from the ancient Hindu scripture known as The Skanda Purana we have these verses: "Arunachala is the most sacred holy place of all. It is the heart of the world. Know it to be the secret and sacred heart-center of the God Shiva. 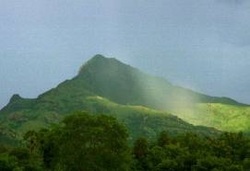 Brilliant lights are seen to sail about Arunachala that seem to be under intelligent control. There is supposed to be a city inside of the mountain. It is inhabited by yogic adepts. Upon death if you are not quite high enough to merge with the Supreme Spirit then you might at least go to live inside Arunachala. The adepts from inside Arunachala can change their shape to any human or animal form and travel incognito in the outside world. I had been reading a lot on Sri Ramana Maharshi, Sri Ramakrishna and Sri Vivekananda. A year ago, spirutuality was something of an idle curiosity to me. Then suddenly, out of the blue, I started diving into it with a hunger that surprised myself. I made my first trip (and only trip so far) to Tiruvannamalai some months ago, along with a couple of friends. We drove down from Bangalore. As we neared T'Malai, all of us who have been talking continuously, fell silent. It was as though the silence really 'descended' on us. And as the Arunachala Hill came into our view and the view got bigger and bigger, the need to talk seemed to have just dropped away. And after we drove into the town and settled down at the Atithi Ashram, we came out to look at the Holy Hill. It was around 6.30 in the evening and the sun had just set. The sky was faintly alight with the afterglow of sunset. The Arunachala Hill, considered to be a physical and natural manifestation of Lord Shiva, was silhouetted against the darkening sky. I would never forget the feeling I had as we stood around in an empty maidan and looked at the Hill! It wasn't just an insentinent hill. It was Immobility itself, it was Majesty itself, it was Silence itself, It was the Source itself! 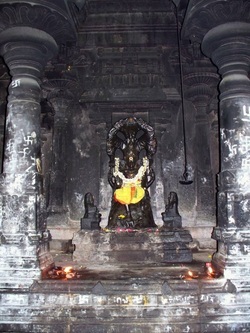 It was like gazing at Lord Shiva in meditation - rock-like and timeless. We just stood there, our eyes glued to the hill, with awe and wonder in our hearts. With peace and nameless thankfulness flooding our hearts. An unfogettable experience! To speak the truth, I have always been a reluctant pilgrim - I could never identify or enjoy crowded temples and loud rituals. I am also not given to excesive emotionalism and credulity. But I can also tell you this: Standing there in that grassy patch, with evening traffic noises from the nearby road floating down, and gazing at that power- filled sight of the Hill - I feel I came closest to God, the unmanifest potential. 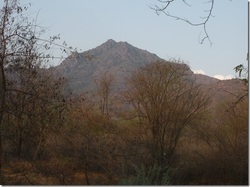 PS: There are many other hills around Arunachala, and geographically, there is nothing unique about the hill. It is just like any hill with scattered boulders and sparse vegitation. But try to look away and you will feel the silent power of this spiritual center! It is like a silent call to our source!